1080p Full HD absolutely enjoys better visual quality than 720p, but there are still some times that you need convert 1080p to 720p. Follow this article to find out how to downsize and convert 1080p to 720p without quality loss. The answer is simple: video resolution converter for mac. 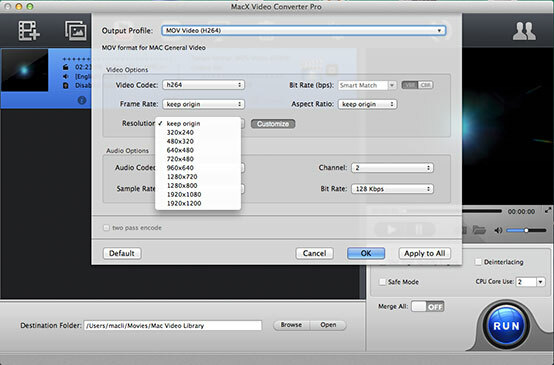 Here we highly recommend MacX HD Video Converter Pro. This app features the strong ability to convert 1080P to 720P, 4K Ultra HD to 1080P/720P, 1080P to DVD 480P/576P, formatted with MP4, MOV, FLV, AVI, MKV, WMV, 3GP, SWF, etc, and also compress videos to iPhone X/8/7/6s/Plus, iPad Pro, iPad Air 2, iPad mini 4, Samsung, Nokia, Lenovo, Sony and more with suitable file size and 1:1 quality. Tip: On top of this, it can also empower you to get 720 pixels videos movies download, 1080P HD movies download and even 4K 8K UHD movies videos download free from YouTube, Facebook, Dailymotion, Vimeo, Vevo, Myvideo, Myspace, Metacafe, XNXX, Pandora TV, Instagram, etc. 1000+ video audio sharing sites. How to Convert 1080p to 720p with Ultimate Video Converter? Free download this video transcoder on your PC and launch it. Then you can click "Add File" button to load the 1080p video files. Choose an output format. Here are many formats available such as MP4, MOV, AVI, FLV, WMV etc. Generally, MP4 is high recommended as it's a format widely used with relatively high quality. Tips: You can also select to convert 1080p files to the mobile devices you want like iPhone X/8/7/Plus, iPad Pro, Samsung, Sony, Nokia, Huawei, etc. After you choose the output format, just go to the settings to modify the resolution as 1280x720. Many other advanced parameters like Bit Rate, Video Codec, Channel etc are also available for you to further customize your output file. Click "Browse" button in output setting area, select a destination folder and click OK.
After the above steps, just click "RUN" button on the main interface of this best video compression software to start converting 1080P video to 720P HD. The whole process is speeded up to 5X faster attributing to its hyper-threading tech and multi-core CPU utility supports. Actually both 720p and 1080p are formats for high definition video, quite different from what many users may suppose. 720p is the minimum standard for HD, while 1080p videos delivery Full HD video quality. They share some common features and bring similar perfect video quality. However, distinct differences do exist between them. Below we are going to take a close look at these two resolutions. The main difference between 720p and 1080p comes down to the number of pixels that constitutes the 720p and 1080p images. 720p has about 1 million pixels, as opposed to about 2 million pixels found in 1080p. The latter contains resolution information about twice the amount as that of standard HD, thus a 1080p image can display more details than a 720p image and brings clearer video quality. Part 3: What's Coming Next? Technology never stops evolving and people's pursuit of HD experience keeps on making progress. When you think it's safe with 1080p video, the arrival of 4K and 8K drive many users to turn to this higher definitions. Videos labeled 4K Ultra HD or 8K Full Ultra HD, which are equipped with respective resolutions 4 times and 16 times that of standard 1080p, offer users far more vivid and living visual experience. If you are interested in the next Ultra HD generation, you can totally download a 4K video from YouTube or get 8K full ultra HD videos download and convert 4K 8K to your device easily with this all-in-one HD video converter. High-definition video [Wiki]: High-definition video is video of higher resolution and quality than standard-definition. While there is no standardized meaning for high-definition, generally any video image with considerably more than 480 vertical lines (North America) or 576 vertical lines (Europe) is considered high-definition. Compress 1080p to 720p, or 4K to 1080p/720p with 98% quality reserved.